BALTIMORE, Md. 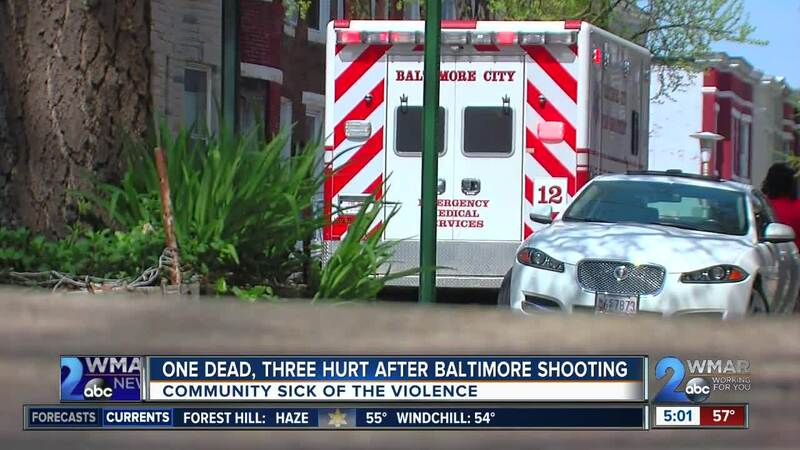 — Four people were shot on Thursday morning on Ruskin Avenue in West Baltimore. One of the victims died Thursday afternoon from his injuries. Several areas were blocked off as police worked to collect evidence. "Anytime you see tape it's never a good thing," said Michael Fergus. Fergus has called Baltimore home for the last 30 years. He saw the crime scene when he was walking home from work. He said, "it's senseless violence. I guarantee you. Whatever it was, it was senseless." Police are working to figure out the connection between the men and what exactly happened. If you know anything call 410-396-2221 or Metro Crime Stoppers at 1-866-7Lockup. So far this year, 10 days is the longest span without a shooting death in the city. "It was a nice stretch without anybody being murdered in Baltimore City," said Fergus. He added, "all good things come to an end." The end came hard. A shooting on Tuesday where a person was killed and three people were killed on Wednesday. "I just pray for a change," said Maria Turner. She lives in the area of the shooting with her children. She said, "they don't come outside without me." She said this isn't the first time there's heard gunfire in the neighborhood. "One time I heard gunshots when I was taking my trash out. I ran back in the house," said Turner. She said all she can do is stay alert and pray. "I’m gonna keep praying. I love Baltimore – born and raised here," said Turner. "I don’t want to leave. I just pray it gets better."